The CERBA foundation, created by the initiative of the CERBA institute (laboratory of medical analyses) supports health programs and participates in prevention programs. The foundation recently organized a prize addressed to the internal employees who act in this domain. Laurence, a CERBA employee and member of Haiti Futur, presented a project destined to equip schools of the Camp-Perrin district with first aid kits. Among 23 projects, 5 were selected included Laurence and Haiti Futur. 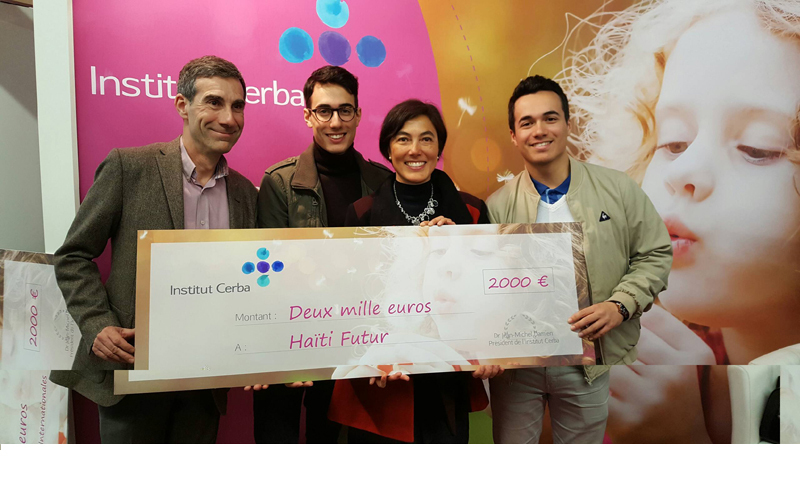 The award ceremony (and 2 000 € check) took place at the “Salon de la Santé pour tous,” started in March, at the Espace Camperret (Paris). Many thanks to the CERBA Foundation and Laurence on behalf of the students from the establishments that will benefit very soon from these first aid kits.